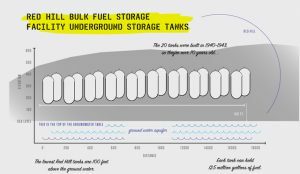 What contains 250 million gallons of diesel and jet fuel, is 75 years old and leaking? Fate is fickle, and it knows no bounds. 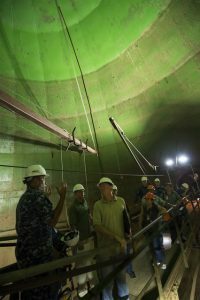 Such is the case with an underground storage tank (UST) facility hidden in the Red Hills of Pearl Harbor, which is still in operation after more than 75 since the infamous events that lend to its namesake. These USTs lie more than 100 feet below solid rock, and are so impossibly massive that it simply boggles the imagination. Pearl Harbor was, and remains, a critical military base for a variety of reasons, not the least of which is to serve as the NAVY’s self-serve gas station serving the pacific. In and around 1939, NAVY thinkers realized that all of the millions of gallons of various types of fuel stored in above ground storage tanks (ASTs) were at risk to enemy attack or sabotage, and as such, on the day after Christmas 1940, construction began on what would be called The Red Hill Underground Fuel Storage Facility. Work would proceed at a breakneck pace: 24/7 and be completed within 3 years – 9 months earlier than anticipated. As fate would have it, work was stopped only once, on December 7, 1941, when Japan attacked Pearl Harbor. Even then, the worked barely stopped because the facility was 3 miles from Pearl, and 100 feet below ground. How critical was the completion of Red Hill? Red Hill consists of 20 underground storage tanks, positioned in two rows of 10. Each tank measures 250’ tall and 100’ in diameter and holds 12.5 million gallons of fuel. To provide some context, if you lowered the Statue of Liberty inside one of the tanks, you’d still have 100’ overhead, and if you were so inclined, you could additionally pack dozens of them, shoulder to shoulder, and have plenty of room to spare. I’ll save you the time and do the math for you – the entire system holds more than 250 million gallons of fuel, all gravity fed through underground piping, and is located approximately 3 miles from Pearl Harbor. There have been several leaks at the facility, the causes of which remains unclear, but as you can imagine, after 75 years, corrosion is a serious concern. By sure happenstance, I cut my teeth in the corrosion-mitigation field on, or I should say in, underground storage tanks. In the late 1980s, the EPA developed regulations requiring that all steel UST’s be internally lined, cathodically protected, or removed. Our firm, by pure coincidence (fate?) was ideally positioned to do this type of work, having been one of the few firms in the country to have already developed the techniques and skills to safely de-gas, cut open, enter, and internally line underground fuel oil storage tanks like those at your typical neighborhood gas station. I had become intimately familiar with the science associated with all aspects of corrosion mitigation pertaining to USTs, both internal and external, and had further come to understand that, contrary to popular belief, most corrosion and perforations were observed to be occurring on tank exteriors, not the interiors, and that older tanks were less likely to leak than newer tanks. Let me repeat that: data conclusively showed that older UST’s were less likely to leak than newer ones. It turned out that rust on the tank exteriors builds up over time and creates a patina of iron oxide, which is an impediment to ongoing corrosion. Iron oxide (rust) will function exactly like a protective coating, so long as it remains well adhered to the steel substrate. In essence, older tanks, which had not leaked in the first, say 10 years, had developed this patina of rust which reduced the external corrosion rate to close to zero (unless something caused the ground to shift, or underground water became a factor that might have disturbed the protective iron oxide film). EPA regulations recognized the fact that most perforations occurred from the outside in and, therefore, required that internal linings perform a dual role – the first was to prevent any internal corrosion (the nature of which is complex and interesting, but too long for this blog), and the second was to maintain the integrity of the tank shell should it develop a perforation. Coating systems were required to be installed at a nominal dry film thickness (DFT) of 100 mils. The concept was that, since the interior coating was so thick, the tank would not leak if it developed a “small” perforation, as the interior coating was of sufficient cohesive strength and integrity to provide adequate containment. I recall roughly 20 years ago, when a client called after removing a small, 2,500-gallon UST. They requested that we take a look at the tank – as there was something interesting to see (they had removed the tank for financial reasons, not because it had leaked). The tank exterior appeared to be utterly corroded, pitted, and in a great number of locations, perforated. It was apparent that the steel was completely absent in many locations. I had asked if the tank had leaked and the engineer, who had a big smile on his face, said “no”. I was then directed to the inside of the tank. The engineer shined his flashlight at the coating system (which was well over 14 years old), and it was perfect – bright, shiny blue, and fully intact. The coating, at 110 mils DFT had done exactly what it was designed to do – prevent the tank from leaking despite substantial tank wall loss and perforations due to exterior corrosion. I had read some of the corrosion mitigation plans associated with Red Hill and, frankly, they made little sense to me. So, I did what I always do, and started to call – everybody. Naturally, no one was interested in talking until I reached a gentleman in California who was actually the right person. How could I tell? Because he was rude and abrupt, and obviously knew his stuff. Larry: (NAVY guy): What do you want? What are you selling? ME: We provide vendor-neutral corrosion mitigation consulting. I know more than any person has any right to about USTs (me, trying to be funny) and was wondering if you had a moment? Larry: (irritated) Do you know how many calls I get a day with people trying to sell me something? Me: I’m not trying to sell you anything – I’m trying to discuss technical issues associated with these tanks. Somebody there has it all wrong. Larry: (really steamed now) You have about 30 seconds. Me: We consult on all issues pertaining to corrosion, and we happen to be particularly competent with USTs. I’ve personally lined dozens of them and have worked on thousands of similar projects. Larry: (clearly getting ready to hang up now) Do you know how big these tanks are? Me: Larry, size doesn’t matter. A square inch of steel doesn’t know if it’s on a bridge, in a sulfuric acid tank, swimming pool, part of a sculpture or a manhole. The fundamentals of corrosion and methods of mitigation are exactly the same. The only difference with Red Hill is scope and magnitude. That’s all. Larry: (really steamed now and yelling) Do you honestly believe that? Me: (certain that this would be the end of the call) Yup. Larry (pausing for a moment): Ok then. Let’s talk. And talk we did, for nearly an hour. The problem in addressing the corrosion mitigation concerns pertaining to a project this size, sadly, is not technical in nature – but political. There are so many dozens of engineering firms, paint companies, NAVY personnel, and corrosion “specialists”, that Larry was simply overwhelmed with data. The fundamental problem is that so much money was associated with the mitigation plan, that companies could afford to invest small fortunes to ensure their participation – regardless of the technical merits. Sadly, I’ve called and emailed Larry a number of times and have not heard back. After all, CCG is one, tiny firm – of opinions which are often at odds with those of which much larger entities. But I will continue to vigilantly contact Larry until he asks me not to. There are technical truths associated with managing corrosion issues related to these tanks – and I feel compelled to bring those to someone’s attention. I hope fate will take a turn in CCG’s, and Red Hill’s, favor.